If only Fed Governors and Presidents understood a little bit more about Monopoly, and a tad less about outdated historical models such as the Taylor Rule and the Phillips Curve, then our economy and its future prospects might be a little better off. That is not to say that Monopoly can illuminate all of the problems of our current economic stagnation. Brexit and a growing Populist movement clearly point out that the possibility of de-globalization (less trade, immigration and economic growth) is playing a part. And too, structural elements long ago advanced in my New Normal thesis in 2009 have a significant role as well: aging demographics, too much debt, and technological advances including job-threatening robotization are significantly responsible for 2% peak U.S. real GDP as opposed to 4-5% only a decade ago. But all of these elements are but properties on a larger economic landscape best typified by a Monopoly board. 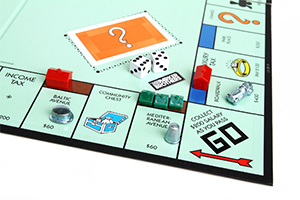 In that game, capitalists travel around the board, buying up properties, paying rent, and importantly passing “Go” and collecting $200 each and every time. And it’s the $200 of cash (which in the economic scheme of things represents new “credit”) that is responsible for the ongoing health of our finance-based economy. Without new credit, economic growth moves in reverse and individual player “bankruptcies” become more probable. But let’s start back at the beginning when the bank hands out cash, and each player begins to roll the dice. The bank – which critically is not the central bank but the private banking system– hands out $1,500 to each player. The object is to buy good real estate at a cheap price and to develop properties with houses and hotels. But the player must have a cash reserve in case she lands on other properties and pays rent. So at some point, the process of economic development represented by the building of houses and hotels slows down. You can’t just keep buying houses if you expect to pay other players rent. You’ll need cash or “credit”, and you’ve spent much of your $1,500 buying properties. To some extent, growth for all the players in general can continue but at a slower pace – the economy slows down due to a more levered position for each player but still grows because of the $200 that each receives as he passes Go. But here’s the rub. In Monopoly, the $200 of credit creation never changes. It’s always $200. If the rules or the system allowed for an increase to $400 or say $1,000, then players could keep on building and the economy keep growing without the possibility of a cash or credit squeeze. But it doesn’t. The rules which fix the passing “Go” amount at $200 ensure at some point the breakdown of a player who hasn’t purchased “well” or reserved enough cash. Bankruptcies begin. The Monopoly game, which at the start was so exciting as $1,500 and $200 a pass made for asset accumulation and economic growth, now turns sullen and competitive: Dog eat dog with the survival of many of the players on the board at risk. All right. So how is this relevant to today’s finance-based economy? Hasn’t the Fed printed $4 trillion of new money and the same with the BOJ and ECB? Haven’t they effectively increased the $200 “pass go” amount by more than enough to keep the game going? Not really. Because in today’s modern day economy, central banks are really the “community chest”, not the banker. They have lots and lots of money available but only if the private system – the economy’s real bankers – decide to use it and expand “credit”. If banks don’t lend, either because of risk to them or an unwillingness of corporations and individuals to borrow money, then credit growth doesn’t increase. The system still generates $200 per player per round trip roll of the dice, but it’s not enough to keep real GDP at the same pace and to prevent some companies/households from going bankrupt. The system still generates $200 per player per round trip roll of the dice, but it’s not enough to keep real GDP at the same pace. *To elaborate just slightly, total credit, unlike standard “money supply” definitions include all credit or debt from households, businesses, government, and finance-based sources. It now totals a staggering $62 trillion in contrast to M1/M2 totals which approximate $13 trillion at best. Now many readers may be familiar with the axiomatic formula of (“M V = PT”), which in plain English means money supply X the velocity of money = PT or Gross Domestic Product (permit me the simplicity for sake of brevity). In other words, money supply or “credit” growth is not the only determinant of GDP but the velocity of that money or credit is important too. It’s like the grocery store business. Turnover of inventory is critical to profits and in this case, turnover of credit is critical to GDP and GDP growth. Without elaboration, because this may be getting a little drawn out, velocity of credit is enhanced by lower and lower interest rates. Thus, over the past 5-6 years post-Lehman, as the private system has created insufficient credit growth, the lower and lower interest rates have increased velocity and therefore increased GDP, although weakly. Now, however with yields at near zero and negative on $10 trillion of global government credit, the contribution of velocity to GDP growth is coming to an end and may even be creating negative growth as I’ve argued for the last several years. Our credit-based financial system is sputtering, and risk assets are reflecting that reality even if most players (including central banks) have little clue as to how the game is played.Ask Janet Yellen for instance what affects the velocity of credit or even how much credit there is in the system and her hesitant answer may not satisfy you. They don’t believe in Monopoly as the functional model for the modern day financial system. They believe in Taylor and Phillips and warn of future inflation as we approach “full employment”. They worship false idols. Money supply or “credit” growth is not the only determinant of GDP but the velocity of that money or credit is important too. To be fair, the fiscal side of our current system has been nonexistent. We’re not all dead, but Keynes certainly is. Until governments can spend money and replace the animal spirits lacking in the private sector, then the Monopoly board and meager credit growth shrinks as a future deflationary weapon. But investors should not hope unrealistically for deficit spending any time soon. To me, that means at best, a ceiling on risk asset prices (stocks, high yield bonds, private equity, real estate) and at worst, minus signs at year’s end that force investors to abandon hope for future returns compared to historic examples. Worry for now about the return “of” your money, not the return “on” it. Our Monopoly-based economy requires credit creation and if it stays low, the future losers will grow in number.